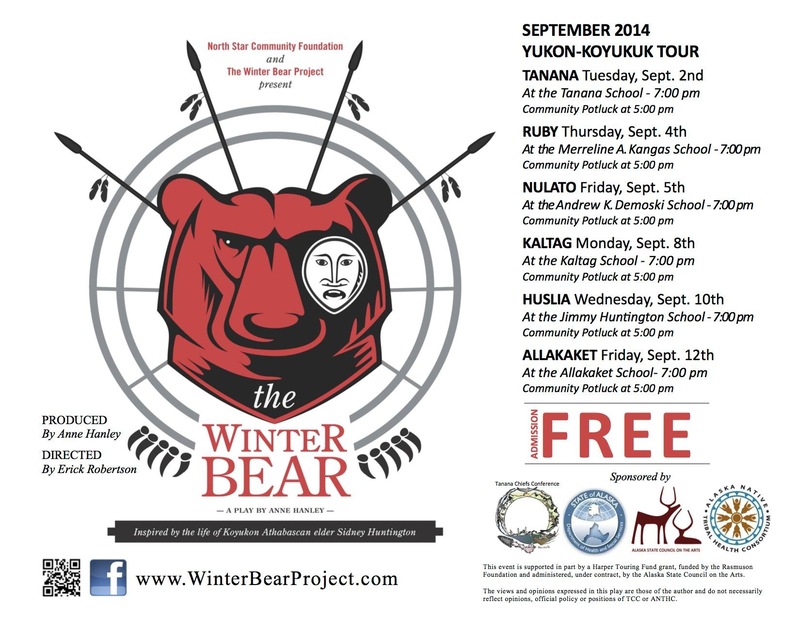 The Winter Bear play was performed in Huslia on September 10th. The Huslia Tribal Council welcomed the cast and crew with a community potluck. The Jimmy Huntington School hosted the play. The play had two acts with a 15-minute intermission. The Winter Bear is a play that tells the story of an Alaska Native teenager who rises above the traumas of his past to become a leader with the help of mentor Sidney Huntington and a Winter Bear. The day after the play, the cast and crew visited each classroom to talk about what they learned and to teach workshops. Huntington lives in Galena, but grew up in the Hog River area. He is an author of the book, Shadows on the Koyukuk: An Alaskan Native’s Life Along the River. 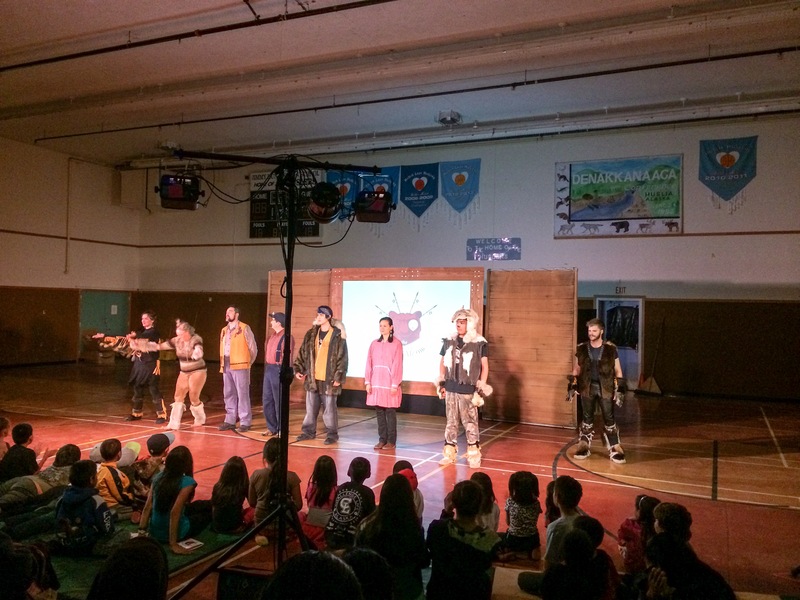 The play was first performed in Anchorage in 2010, but has since travelled to the Tok, Tanacross, Northway, Mentasta, Barrow, Fairbanks and the Copper River and Kenai Peninsula areas. 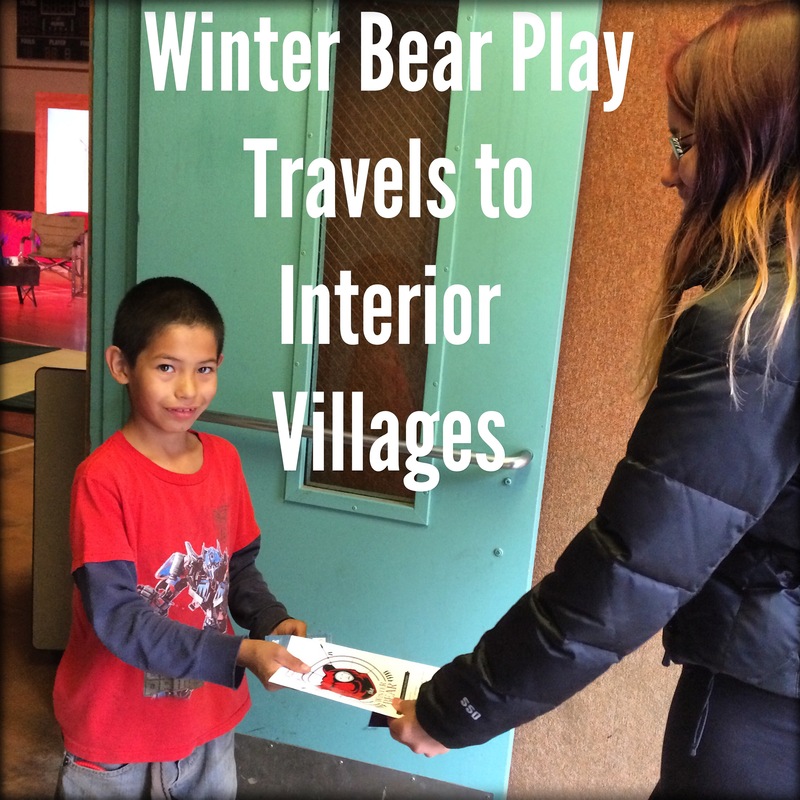 Playwright Ann Hanley said, “It’s always been a dream to travel to the Yukon-Koyukuk River villages. The story belongs to this region.” According to Hanley, the men identify with the hunter and come and share their hunting stories. A parent, Tanya Yatlin, enjoyed seeing the production travel to Huslia. She said, “It might have been a little bit too deep for the kids on some parts, but it kept everyone captivated for the whole time.” A teenager, Janessa Gonzalez, said, “It’s about finding your self-worth. It was pretty funny.” She enjoyed seeing the make-up on the cast members and costumes. The Winter Bear director thanked many organizations who made the traveling production possible, including the Tanana Chiefs Conference, Alaska Department of Health and Human Services, Alaska Native Tribal Health Consortium, Doyon, Limited, Alaska State Council on the Arts, Wright Air Service, Hydz Gear, Yukon-Koyukuk School District, Huslia Tribal Council, Jimmy Huntington School and many other volunteers and local organizations. The actor who played Sidney Huntington was Brian Wescott. Wescott has acted in the play since the beginning. According to Wescott, it has been tough to travel. The whole stage, costumes, lighting and other equipment has to be set up, taken down and re-packed for each performance. They slept in gym floors and have to wake up before school comes into session. With a smile on his face, Wescott said, “It’s wonderful though.” He enjoyed ‘Athabascan soul food’, including dried moose meat, bear meat and moose soup. According interior Alaskans, Wescott gives a convincing performance of Sidney Huntington. Hanley says people tell them, “That’s just like uncle Sidney.” Wescott modeled his performance after elders from the Yukon Kuskokwim Delta region, where he is from. According to Wescott, Alaska Native elders are very similar across the state. The cast and crew were happy when Sidney Huntington attended the play when it was performed in Nulato. Some students from Galena also traveled by boat to watch that play. Director Erick Robertson spoke with the kids after the play. Wescott said, “The workshops in the classroom are almost as important as the play. We interact with them in the classroom.” Youth open up with the cast and crew. Cards for the Careline Crisis Intervention were handed out with play programs. The number is (800) 273-8355. Wescott wants rural audiences to know, “Your life in this place is really cool and we want you to come and see the show. Your life here matters. We want to come and learn from you and honor your life here.” Wescott and Hanley shared some other message from the play, including stay in school; own up to your life; take ownership of the problems and solve it ourselves; and don’t take handouts. A boy in Kaltag told cast and crew members, “This is the most fun I’ve ever had in my life. I will never forget you guys.” Organizers hope the play will plant a tiny seed that will grow into a root. The Winter Bear Project will continue to tour. They are open to invitations to go to more villages. They rely on grants and sponsorships and federal funds geared toward suicide prevention. Lillian Simon of Huslia said, “I sure hope each of the kids got something out of it.” From the full gym and interaction after the play, residents young and old appeared to enjoy the play. For more information about the Winter Bear Project, visit http://www.winterbearproject.com/. Follow them on Facebook: https://m.facebook.com/winterbearproject.